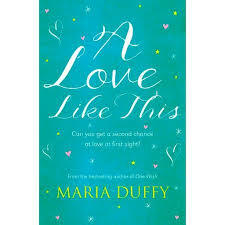 BleachHouseLibrary.ie: "A Love Like This" by Maria Duffy. Dublin, 1985. Two babies are born on the same day and their lives could not be more different. One is the son of well-to-do couple, both with high flying careers and a comfortable existence. The other is the daughter of an alcoholic, raising her family alone and who lives from hand to mouth. When placed side by side in a hospital crib, the two infants comfort each other, despite their parents differences. Over two decades, Will and Donna travel in different circles, occasionally passing each other by. They each grow up feeling like something is missing and with a sense of obligation to their mothers. When Donna's best friend, Lexie, emigrates to Australia, she never dreams that she will see her again. Travelling is not her thing and finances don't stretch to holidays. Will, on the other hand, has a feeling he should escape the drudge of Dublin, and plans the trip of a lifetime. They may share a birthday, but can their paths cross over when they are on opposite sides on the world? Tragedy strikes back in Dublin, and Donna suddenly finds herself Australia bound, with a list of places to visit and someone else's dreams in her backpack. A chance encounter in New Zealand and a spark of intense attraction is where the lines of destiny seem to intertwine, but fate intervenes with a dramatic twist. Are these two really meant to be together or is it all too good to be true? This is Irish author, Maria Duffy's fifth novel and she has drawn on her own travel experiences in producing this fine novel. The story opens with a wonderful description of the maternity hospital ward where Donna and Will first cross paths. While Will's mother had expected a private room, and therefore no interaction with other new-mums, she is horrified to discover she has to share the ward with 'common' folk along with their unsightly breastfeeding and cigarette breaks. Donna and Will seem to have other plans, as both babies settle better when in close proximity. The tale then shifts forward in time, with the reader getting a glimpse into the worlds of the growing children. Each has their own cross to bear, albeit in completely different ways. When Will loses a friend, he knows he needs to make changes. Likewise, Donna suffers a great loss and follows the dreams of her sister. The narrative shifts to Australia and New Zealand, with the author lovingly describing locations that are a world away from Dublin. Stunning beaches, lazy outdoor evenings, simmering heat and the odd bit of dolphin spotting. Donna and Will are joined by strong supporting characters and a few twists along the way. Great pacing, with each change in timeline clearly highlighted (books can often be an uncomfortable read when this is not done). Also, Donna's role as a baker is not over-played, as there is a lot of baking in women's fiction at the moment and I was glad the author didn't choose to go down this route. There was just a hint of her appreciation for cakes, and how it came to be. Similarly, there was only the briefest mention of Will's role as a solicitor. The distinction between their careers and backgrounds was there, but cleverly underplayed. This is a story of fate, and the role it plays in our lives. Ireland is a fantastic example of this concept, with its small population affording many a chance encounter. Maria Duffy has used her skill at storytelling to bring us a warm, yet believable tale of two babies starting their journeys in life. Polar opposite circumstances, vastly different upbringings, but both with their hearts in the right places. A delightful read which shows how you often don't have to travel far to find your soul mate. An ideal read for fans of Cecelia Ahern or Jane Greene.